On a clear day, you can see the British Columbia mainland from the shores of Haida Gwaii. The archipelago is only about 80 km from the mainland coast but weather and waves can make the distance insurmountable. The people of Haida Gwaii have learned to adapt to this relative isolation through patience and creativity, and so has the local flora and fauna. The adaptations of local wildlife are wide-ranging and sometimes dramatic. Because Haida Gwaii rainforests tend to be dark, local birds, including goshawks, saw-whet owls and hairy woodpeckers have darker plumages compared to their mainland counterparts. It is hypothesized that this adaptation helps to conceal them. Goshawks have also adapted with decreased wingspans to manoeuvre more easily through the narrow flyways below the dense tree canopy. Haida Gwaii bears have developed the largest skulls of any North American Black Bear, likely due to a different suite of available prey items, while smaller critters such as marten and ermine sport skull shapes and sizes substantially different from those of their cousins on the mainland. Local marten, taking advantage of the large niche created by the lack of local mid-sized predators, have grown bigger than their mainland counterparts and may be capable of preying upon larger mammals, such as introduced deer. The Haida Gwaii subspecies of saw-whet owl, known as the brooksi, is the only native species of owl on-island. This local subspecies has discovered that intertidal zones boast an abundance of food, such as beach hoppers and other invertebrates. Since the owls are not threatened by other night time predators such as the larger owl species found on the BC mainland, they can freely gorge themselves on these intertidal critters. Blue herons have changed their behaviour as well. In response, perhaps, to the vast numbers of island eagles, they have abandoned their colonies and now nest in single nests, well away – sometimes up to 10 km – from the ocean. In fact, while both blue herons and saw-whet owls are typically migratory birds, the local populations have adapted to live in Haida Gwaii year-round. These unique relationships and interactions make studying wildlife on Haida Gwaii a fascinating undertaking. 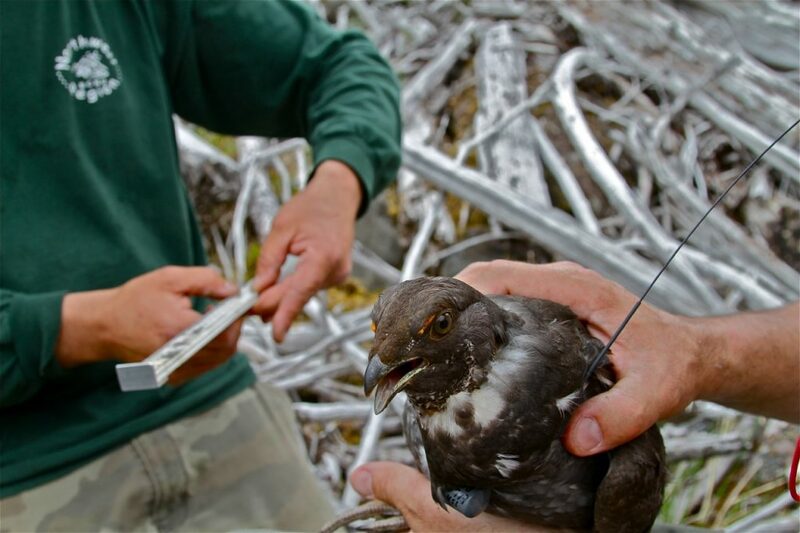 When the Haida Gwaii Sooty Grouse Research Project started seven years ago, the researchers weren’t looking for the unexpected; after all, grouse behaviour had been studied pretty comprehensively elsewhere. The research team was interested in finding out whether the local grouse population, an important prey item for goshawks, was in decline and if so, why. Was it the habitat changes brought on by forest harvesting? The influence of the large number of introduced deer? Other factors? To find out what was going on, the team caught more than a hundred and seventy grouse and fitted them with radio collars. 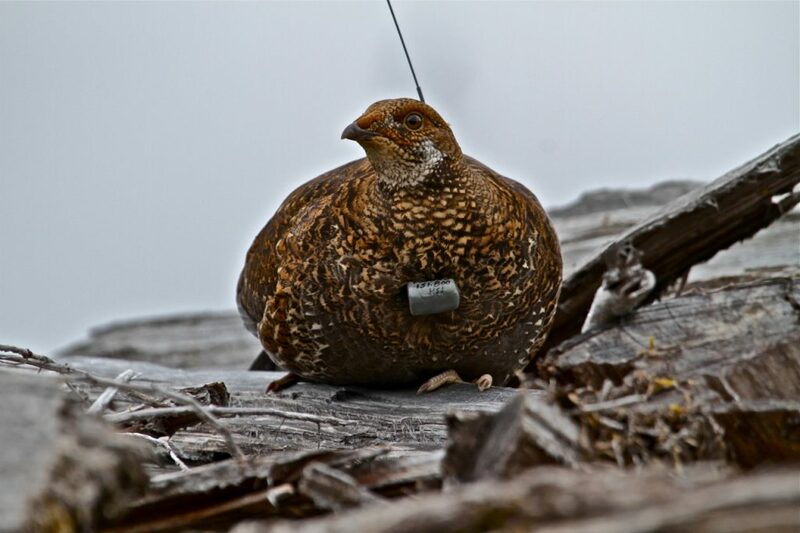 This enabled the researchers to track the birds’ movement patterns, determine seasonal habitat usage, and locate grouse nests. When, during the breeding season, a tagged female stopped moving for a few days, it was a good bet she had started nesting. Using radio telemetry, the nest was located and a motion detection camera deployed to hopefully record hatch success. Radio telemetry is, at times, more of an art than a science. While the basics are pretty straightforward – you put a radio transmitter on a critter, release it and then use a receiver to lock onto its unique radio signal to help guide you to its current location – in the real world this guiding is less straight forward. 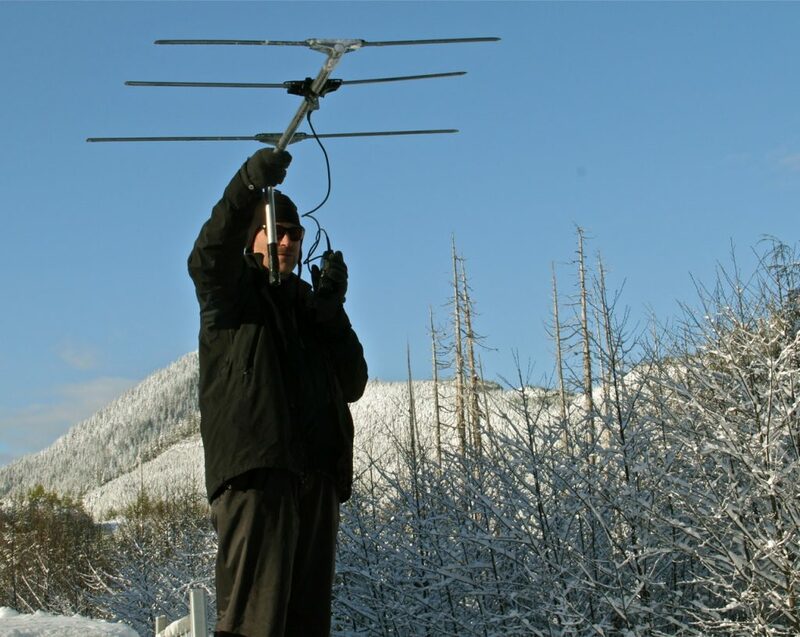 The radio signals don’t travel in straight lines; they bounce off slopes, are re-directed by trees or rocks, are affected by high moisture content in the air and can be nearly silenced when the source signal is located in a depression. For rookie field crews, initial searches involve a lot of unnecessary bushwhacking, bog traversing and fighting off salal attacks, in search of an ever changing, at times seemingly illusive signal. Researchers quickly learn to “read the sign”, including accounting for topographical or vegetation impacts to the signal, checking directions frequently and constantly adjusting their path forward. When you walk towards a radio signal, you judge your progress by how strongly the signal is received. When the signal gets stronger, the beep gets louder, signalling that you are getting closer. This aural assistance disappears when you get within 20-30 meters of the transmitter. At this point, the signal is as strong as it is going to get and it now becomes a matter of visually locating the grouse wearing the collar. Crews tread carefully at this stage, not just to prevent the grouse from moving off her nest, but also, literally, from not stepping on a grouse. Sooty grouse belong to the family Tetraoninea which also includes Spruce grouse, Ruffed grouse, Sharp-tailed and Sage grouse as well as Ptarmigan and Prairie chickens. This family has a wide distribution ranging from Iceland and Greenland to Eurasia and North America. While they have adapted to a wide variety of ecosystems, one characteristic that has remained commonplace is their choice of nesting sites. Whether it’s the arctic tundra, coastal rainforest or inland plains: grouse typically nest in shallow depressions on the ground, often beneath cover, with a thin lining of plant material. Not the most secure of locations, but somehow it has been sufficiently successful to maintain the species. In characteristically Haida Gwaii fashion, local Sooty grouse behave atypically. The research crew discovered that somehow the island grouse must not have gotten that ground-nesting memo. They first observed some grouse nests located on high stumps, which was unexpected and interesting. Soon thereafter, a grouse nest was detected 2.5 meters up in the air on a 45 degree leaning tree. That created some excitement amongst the crew, thinking they might have located the highest known grouse nest in North America. That was only the beginning. By the next field season new nest champions emerged, nestled ever higher in the crooks of trees or on mossy platforms on tree branches. While exciting, trying to find these nests often proved problematic. Locating nests in dense understory was one thing, but looking up into a cluster of trees, hoping to spot a remarkably well camouflaged grouse took time, skill and a healthy dose of luck. Mossy platforms, more often associated with Marbled Murrelet nests, turned out to be popular sites for the non-conformist tree dwelling grouse. Sometimes, after extensive circling, using binoculars and zoom lenses, looking for the right angle to get a glimpse, it would be the tail feathers, sticking up or sticking out which would give the grouse away. Or, surprisingly perhaps, often it was the bird’s eye in the sky, staring intently at the interlopers below. By the end of the study, some 15 grouse tree nests had been located with the highest one hidden away 18 meters up high. Straight up. And they say grouse aren’t good flyers! Mind you, not all Haida Gwaii grouse nested in trees, in fact they nested just about anywhere: on stumps, on logs, on top of root wads, on a cliff, inside hollow trees, inside waste wood piles in a variety of tree species, and on the ground. Every nest search created excitement. The crew would never know what nest location choice that particular grouse had made, or why. Was it to evade predators? Avoid the wet understory? Hopefully, the upcoming data analysis will provide answers. Meanwhile, the research team will remember this particular study fondly. In spite of the aches and pains, the ineffectiveness of their rain gear for the Haida Gwaii weather, the miles and miles of searching and bushwhacking, they gained a new respect for the adaptiveness of the Sooty grouse. The Haida Gwaii Sooty Grouse Project was spearheaded by Frank Doyle of Wildlife Dynamics Consulting and Louise Waterhouse, Coast Area Research, Ministry of Forests, Lands, Natural Resource Operations and Rural Development. Other team members included Melissa Todd, Coast Area Research, FLNRORD and Ross Vennesland, Parks Canada. Field technicians included Gerry Morigeau, Kiku Dhanwant, James MacKinnon and Miranda Barnhardt. Special thanks to management and staff at the Haida Gwaii District, FLNRORD without whose enthusiastic participation and support this project would not have succeeded. Thanks also to Mike Schroeder. Funding of the project courtesy of Habitat Conservation Trust Foundation, FLNRORD, Parks Canada, Husby Forest Products and the Upland Bird Society.